If homogeneity or harmony is the predominant social condition in support of legitimacy, a different assumption can be made with relation to reputation (Baccarani & Golinelli, 1992). According to a popular definition, reputation is the expression of corporate conduct aimed to differentiate the company from competitors in the perception of competitive rivalry (Elsbach, 2006, Rao, 1994 and Rao et al., 2003). A key marketing strategy to achieve this competitive differentiation is product or corporate branding. In this context, Mudambi (2002) holds that B2B decision making is increasingly drawing on branding, a fact which has been generally underestimated so far in industrial marketing. Based on a literature review and differentiating consumer and industrial market characteristics, Mudambi suggests a model for B2B branding with the company brand as the central form of the branding strategy identifying three buyer clusters. 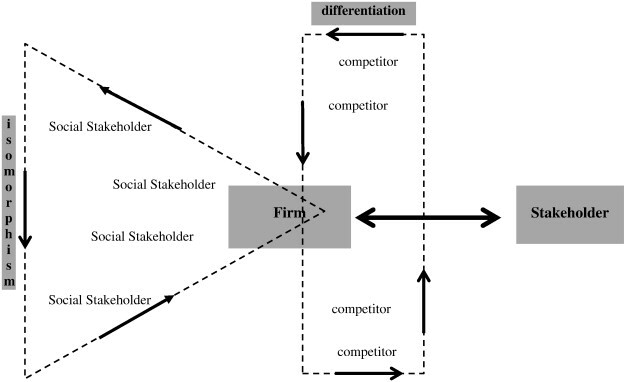 The model, however, lacks a wider triadic stakeholder marketing perspective as referred to by Abdolvand and Charsetad (2013). Reputation is therefore that set of aggregate perceptions and evaluations, developed by stakeholders and induced by the process of corporate branding, that favor the company against its competitors ( Fombrun, 1996 and Roberts and Dowling, 2002). Referring to a supply chain perspective, this view is reflected in the following quote: “Greening your supply chain can achieve reputational and efficiency gains, savings to the bottom line and ultimately increased revenue” (http://www.carbontrust.com/client-services/advice/business-advice/green-supply-chain). In this context, Abdolvand and Charsetad (2013) innovatively proved that social corporate performance positively influences positioning differentiation and, importantly, brand equity. A bi-directional relationship between legitimacy and reputation is implied when juxtaposing Fombrun’s and Rindova’s et al.’s proposed perspectives. While the first holds that compliance with rules and social practices may be what actually favors the establishment of competitive differences between the compliant company and its competitors, Rindova et al. (2005) argue that a perceived high quality of products means a greater business prominence in the minds of the stakeholders involved. This view is exemplified by the Italian company Parmalat which, due to de-legitimated financial behavior did not reflect contextual consonance (Bank of America declared ‘false’ a bank active account of Euro 3.95 billion specified in the balance sheet). The firm managed to keep its reputation due to a re-vamped corporate identity and personality (see Fig. 2). The result was that the savers continued to buy Parmalat’s bonds. In this case, from a consumer perspective, reputation gave legitimacy to the firm. Figure options It is clear that the reputational state, also due to contextual conformism (legitimacy), tends to add value to the corporate brand, allowing the company to offer products with higher (reputational) quality at higher prices. Corporate branding planning aims therefore to reduce information asymmetry with relation to target evaluation, the degree of purchase risk faced by the individual/consumer, and unawareness by the target of corporate features that are beyond the products/services on offer (firm specific). For the purpose of this work, it is important to consider the adoption of a symbolic approach which considers reputation as a conformity aimed at competitiveness, representing on the one hand its resources and dynamics, and, on the other hand, the current results and future ambitions (Love and Kraatz, 2009 and Van den Bosch et al., 2005). As part of this symbolic approach, the notion of conformity does not only express the semantic adaptability that the company displays towards the relational partner (individual/consumer/target), but also a cognitive, emotional and cultural adjustment in terms of structures and practices (Love & Kraatz, 2009). Symbolic representation, aimed at conformity, can be therefore seen as the process of creation/maintenance of corporate reputation, which covers both spontaneous and planned communication activities. While spontaneous communication results from corporate behavior seen as expression of values, culture and corporate personality, planned communication (corporate identity) is on the other hand the symbolic representation (visual identity) of what the company is (corporate brand) and of what it offers in terms of values and culture (product brand) (Fombrun & van Riel, 2003). Van Riel and Balmer (1997) define corporate identity as ‘the way in which an organization’s identity is revealed through behavior and communications, as well as through symbolism to internal and external audiences’ (Van Riel & Balmer, 1997). The process of corporate identity is that set of marketing and communication activities undertaken by the company in order to build favorable associations and positive reputation towards all stakeholders (Hatch & Schultz, 2008). The creation of a corporate identity, either of brand or of product, aims so as to achieve a high level of recognition by relevant stakeholders and at developing the ability to transfer value to them. Corporate identity has therefore the purpose of helping the individual/evaluator to develop his perceptions by reducing the risk linked to the purchase of company products. We can say that corporate brand is a ‘script’ that simplifies the decision-making process while associations, developed on the basis of expectations, are about cognition, affection, evaluations. Such evaluations (corporate image) represent the result of perception that stakeholders, as recipients of corporate behavior, develop either towards the distinctive/competitive capabilities of the company (with relation to finance, organization, production, sales, etc.) or towards the corporate essence compared to that of other companies (Barnett and Salomon, 2006, Rindova et al., 2005 and Van Riel and Fombrun, 2007). According to such principles, the firm, both through planned and spontaneous marketing and communication activities, tends to create, maintain and develop its reputation on the basis of two main goals: being known and being known for something (Lange, Peggy, & Dai, 2011). The ‘being known’ goal is about stimulating and developing stakeholders’ awareness in order to make the company/organization/brand prominent compared to its competitors, with relation to corporate essence, the latter considered from a holistic perspective (Rindova & Petkova, 2007). In conclusion, conventional thinking holds that legitimacy is a requirement of all organizations whereas reputation is a desirable, but not an essential property. This article is a part of a series. Read part 2 here. The term legitimacy was defined by Parsons, 1956 and Parsons, 1960 and then Weber (1978) as a state of congruence towards laws, rules and social values. Scholars of social theory, organization, and the Resource-based View Theory introduced the notion of legitimacy in their theories (Johnson et al., 2006, Ruef and Scott, 1998, Salancik and Pfeffer, 1978 and Suchman, 1995). In the late ’70s, pioneers of the Neo-Institutional approach, such as Meyer and Rowan (1977) and Zucker (1977), while analyzing the ability of an organization to achieve survival, stressed the importance of expressing behavioral patterns conforming to standards, rules and beliefs of the reference context, in addition to more established factors such as organizational efficiency. From the seminal work of Meyer and Rowan onwards, all scholars belonging to the neo-institutional school argue that organizations that shape their behavior to moral rules and regulations of their reference context can be defined as legitimate. According to Fan (2005) (in Kaufmann, Vrontis and Czinkota, 2012 and Camilleri, 2008), effectively communicating legitimacy related values might give the company a differential and competitive advantage. In this context, Hawn, Chatterji, and Mitchell (2011)differentiated between market (related to market actors) and social legitimacy (related to non-market actors) in generating economic value and, innovatively, investigated their interactions. They elicited that increasing their social legitimacy is less beneficial for companies being already on a high level of market legitimacy; on the other hand, the high level of market legitimacy may substitute for a decreasing social legitimacy. This constant search for contextual conformity and, hence, survival may shield the company from any behavioral change that could induce sanctioning reactions (i.e. strikes) from context members (Brown, 1998). The meaning of legitimacy employed in this study is succinctly expressed by Scott (1995, p. 45), who argues that “legitimacy is not a commodity to be possessed or exchanged but a condition reflecting cultural alignment, normative support, or consonance with relevant rules or laws”. The social dimension of branding in this context is expanded by Meads and Sharma (2008, p.9) who state that: “The business becomes a social purposeful system with the brand aspiring towards ‘social value’” (Meads & Sharma, 2008, p.9). These definitions mark the central hypothesis of our research: legitimacy should be regarded the conditio sine qua non both to the social acceptance of the company and to a coherent implementation of reputation strategies. These considerations, however, highlight the existence of a gap in the line of studies regarding corporate/brand reputation. According to research by Van Riel and Fombrun the corporate image that stakeholders develop as a result of corporate communication activities, refers to four domains (product, social, financial and employment) and is aimed to distinctly recognize the company from among its many competitors (Brown et al., 2006, Davies et al., 2001, Fombrun, 1996, Fombrun and van Riel, 2003, Gioia et al., 2000, Illia and Lurati, 2006, Pruzan, 2001, Scott and Lane, 2000, Van Riel and Fombrun, 2007 and Whetten and Mackey, 2002). However, this assumption considers conformity of the company to rules, norms and cultural values of the reference context, as a behavior merely aimed at standing out in the competitive scenario characterized by a condition of rivalry. This view overlooks that behavior consistent with context requirements also allows the company to reach a perceptive, solely institutionally and even context targeted, positioning in constituencies’ minds (cognitive legitimacy) and does not necessarily result in distinctive evaluations compared with competitors, or an effect on financial results (Suchman, 1995). Hence, corporate legitimate behavior should not be regarded as having competitive and/or financial motives in the first place. For example, many place marketing studies conclude that the extent of compliance of an organization with social expectations can reinforce or reduce a territory’s attractiveness (for example, companies that do not meet environmental standards may make the area in which they operate to be perceived as highly polluted and, therefore, economically, socially and/or touristically unattractive) (Chiu, 2011 and Zimmermann, 2001). Following this line of thought, corporate behavior and, in its wake, the entire supply chain behavior, may trigger a dual (economic and institutional) approach towards its reference context. This work shows that in the first case, when corporate behavior is merely geared towards the bottom line, reputation is exclusively seen as the capacity to cause results related to competitiveness. The institutional approach, on the other hand, caters to the social, cultural, ethical role that the company plays within its reference context, and, therefore, is also about how the company itself is socially perceived by the community with which it interacts either directly or indirectly (Rindova, Williamson, Petkova, & Sever, 2005). Some researchers describe the firm as either a social ( Kogut & Zander, 1996) or a discursive ( Tsoukas, 1996) community, or as a community of practice ( Constant, 1987 and Kreiner and Lee, 1999). Shifting the perspective, scholars like Kjellberg and Helgesson (2006), Andersson, Aspenberg, and Kjellberg (2008), orAraujo, Kjellberg, and Spencer (2008), and Storbacka and Nenonen (2008) refer to the notion of co-created markets as actors increasingly engaged in market and/or social practices. Recurring social practices, undertaken by individuals and social organizations within a social system, enable the establishment of relations between social players. Such relations in turn will evolve to mutual adaptation of social actors’ respective activities ( Giddens, 1984). This phenomenon marks a process of reflexive self-regulation, typical of social integration phenomena and of cybernetic systems as well as the expression of relational reciprocity among actors who are co-present ( Staber and Sydow, 2002, Wiener, 1948, Bateson, 1977, Beer, 1959,Beer, 1966, Beer, 1985 and Yolles, 1999). 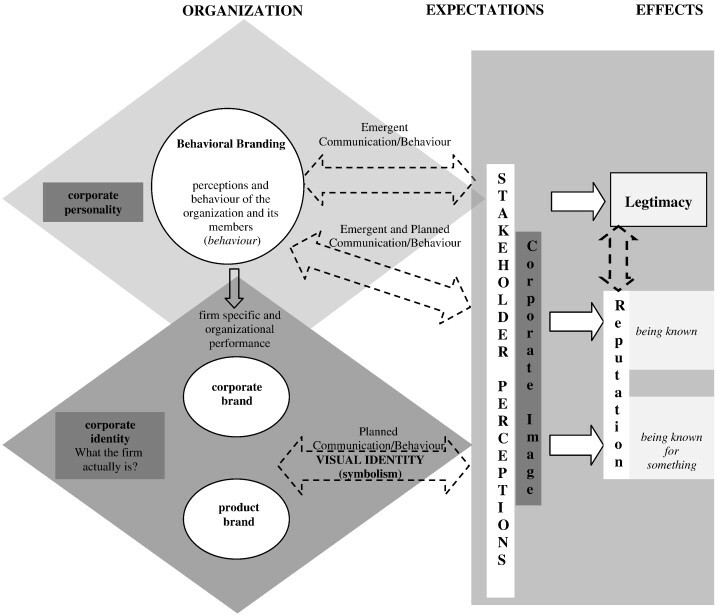 Berger and Luckmann (1966), furthermore, argued that organizations eventually mirror their environment as they reflect socially assembled realities. A constant search by the company for such a state of consonance in the creation and/or maintenance of its relationships and mutual adjustment/change of practices and behavior employed by the social players, therefore express the existence of a continuous adaptation process (Golinelli, 2010 and Maturana and Varela, 1980). In such a dynamic business scenario, the corporate system constantly looks for players with which to create and maintain lasting relations, through the development of, first, a state of consonance, and, then, of resonance. Consonance, as previously mentioned, is a condition that is achieved when the relevant players (corporate and supply chain system and context members) identify a common language and shared emotions/passions, while resonance marks a relational evolution in which the players create opportunities to reach common goals (Barile, 2006 and Golinelli, 2010). Regarding the status, the individual stakeholder could fulfill an alternative or complementary double role. For example, an individual could be a citizen and/or a consumer. In the first case the corporate aim should be to satisfy the environmental and social norms (legitimate behavior), and in the second case to evoke some idiosyncratic features arousing a distinct positioning compared to other competitors (reputation related behavior). The plan is to have the stakeholder express relational consensus following an assessment of corporate conduct. That conduct in turn is shaped by corporate skills and abilities, which are expressions of two dimensions. First, it reflects conformity to social norms, values, rules and meanings operating within the reference social systems (legitimate behavioral corporate skills). Second, it demonstrates firm-specific features, aimed at making the individual/target discern from other companies, due to the perception of either tangible or intangible specific assets (reputation related corporate skills) (Hawley, 1968, Hirsch and Andrews, 1984, Parsons, 1960, Thornton, 2002 and Tolbert and Zucker, 1996). The company that meets the expected standards, rules and values can either present itself as a value setting within its context (industry, place, etc.) together with the other players (constituence/audience), or as a system whose survival goals are the result of differentiation towards its competitors (Deephouse and Carter, 2005 and Golinelli, 2010). Attention is drawn to the innovative organizational behaviors implemented by the firms in Silicon Valley. These behaviors have been, and are still, useful for both to qualify the place, contributing to regional and national economic growth and to increase the reputation and the competitiveness of the local firms. On the other hand, the organizational behaviors applied by some Chinese firms and supply chains, characterized by disrespect of the environmental or legal (i.e. counterfeiting) norms, detrimentally influence the firms’ and country’s reputation. Hence, a social actor evaluates, different from a consumer, the condition of a social organization and may rate this organization “adequate”, because of congruence with the contextual legal and cultural values and norms (Albert and Whetten, 1985, Hannan et al., 2007, Rao, 1994 and Zuckerman, 1999). This acceptance condition reflects a rational-cognitive firm that is congruent with laws, norms and social practices, and mimics the reference context, becoming, in turn, an expression of contextual values. This mimetic approach represents a phenomenon defined by the institutionalist and neo-institutionalist theories as isomorphism ( Di Maggio and Powell, 1983 and Di Maggio and Powell, 1991). Neo-institutionalist scholars regard isomorphism as the key to understanding why companies that operate within the same institutional/social context take decisions and follow behavioral patterns that are usually very similar (Barley and Tolbert, 1997, Di Maggio and Powell, 1991, Jepperson, 1991, Leblebici et al., 1991,Meyer and Rowan, 1977 and Zucker, 1977). According to Meyer and Rowan (1977), the notion of isomorphism implies that organizations should meet the rational criteria set by the institutional context in order to be considered efficient, to maximize legitimacy and resources, and their ability to survive. Isomorphism processes are determined not only by the tendency to conform to the external environment, but also by the action of the environment itself that leads to the creation of new organizations consistent with rational myths (institutionalized rules, norms, procedural ceremonials). With every new myth that consolidates, new organizations correspond to meet the needs that the myth itself has produced (an example is that of companies pursuing the me-too strategy). The best way to manage the conflict between internal rationality criteria and environmental pressure is to develop two parallel structures, one formal, consistent with myths and ceremonials, the other informal, aimed at gaining competitive advantage (Meyer & Rowan, 1977). Taking the generally accepted importance of authenticity, for example, for branding and transformational leadership in terms of leaders and brands being able to “walk the talk” into account (i.e.Kaufmann, Vrontis and Czinkota, 2012 and Lopez, 2011, July 29), Meyer’s and Rowan’s view seems to be very debatable. The relevance of this statement is further supported by the case of the European horse meat scandal. Another example could be the Nike case, where Nike was accused of utilizing children that lived in underdeveloped countries, to produce goods. To show that the behavior was legitimate, the company implemented a control process to evaluate the job agreement and the occupational safety conditions. Nike, by means of these activities, improved its social legitimacy and reputation. Furthermore, Nike adopted the politics named re-use, through which the consumers were encouraged to deliver the used rubber of the shoes to the Nike store, to build and donate some running tracks. The following Fig. 1 suggests that that rational behavior that is aligned to normative and cultural expectations of social context members, especially individuals, gives the company social legitimacy, which could in turn support the creation and/or maintenance of a favorable reputation for the company itself and its members (employees, managers, consultants, owners, etc.) (see Fig. 1). More detailed, isomorphism tends to have different connotations depending on whether it evolves according to cognitive (social beliefs), normative (existence of scarce resources whose acquisition is essential to survival) and/or coercive conditions (existence of rules essential to social and economic activity) (Di Maggio and Powell, 1983 and Leydesdorff, 2000). Cognitive or mimetic isomorphism is characterized by a spontaneous process of imitation and/or interpretation in which the interaction between actors and relevant messages is processed and turned into cultural meaning (Bridwell and Mezias, 2012 and Rao, 1994). Pressure factors such as laws, regulations etc., that lead to compliance: Coercive Isomorphism (Golinelli, 2010). Normative Isomorphism is found in company–context interactions in which a greater ability, knowledge and/or possession of intangible assets is present (facility = ability / capacity), so as to define a condition of pre-eminence of one towards the other. Coercive Isomorphism is found in interactions between actors, every time it becomes necessary to identify rules and/or standards useful to determine how a social actor should behave in order to gain legitimation (i.e. Basel III). The relationship between players and context can therefore be seen as a continuous and mutual adaptation that depends on environmental determinism and the ability of the company to influence its reference context. While the former affects and constrains corporate activities, the latter is intended to influence context entities and to establish the autonomy of the corporate system towards the surrounding reality (Golinelli, 2010). Legitimacy and isomorphism, as described, display something very useful to the development of this study: legitimacy is based on the notion of contextual homogenizing aimed at establishing conformity and congruence, and therefore non-rivalry, against the entire reference context and/or members of it (Deephouse & Carter, 2005). At this stage, it is useful to reiterate that legitimation and reputation play a mutual role aimed at company survival. Based on the conditions of the banking industry, Deephouse and Carter (2005)investigated various interrelationships between isomorphism, performance, and legitimacy reputation as well as the antecedents and dimensions of the latter. They concluded that isomorphism has a positive effect on legitimacy and reputation of companies with a lower level of reputation, however, a negative influence on the reputation of companies with a higher level of reputation. Furthermore, the authors found that a better financial performance increases reputation but not legitimacy. They suggest a study researching the corporate effectiveness implications when losing legitimacy and/or reputation for further research. In addition, they call for an informative case study deviating from the best practice standards to an extent of actually losing legitimacy and for knowledge on managing legitimacy and reputation. By discussing the European horse meat scandal and its managerial cross-functional implications, this paper intends to give a contribution in this context. Cognitive, normative and coercive isomorphism implies a new role definition of marketing, reflecting a paradigm change. In this context, Czinkota (2012) invites participation in an interesting discourse. He recognizes a major shift in the discipline of Marketing related to an increasing societal discontent with marketing and marketing actors due to the detrimental effects of globalization and a resulting global crisis of trust. Czinkota dubs this paradigm shift as curative marketing. He defines this term as a required contribution of marketing/international marketing to restoring and developing international economic health as a precondition for overall welfare. This new direction implies a new spiritual and behavioral orientation for marketers towards bettering the respective societies characterized by salient motives to deliver joy, pleasure, fulfillment, safety, and personal growth, and achieving advancement towards a better society across borders. According to Czinkota the time is ripe for an intensive reflection of marketers in terms of analyzing and accepting the responsibility for the various global shortcomings caused by companies and their supply chains. Mistakes inflicted by the discipline in the past should lead to future action improvements, driven by a ‘damage restitution spirit’. The multidisciplinary theory provided by this paper underpins the development of curative marketing strategies and the corresponding operational marketing behavior. Values, know how or competences reflecting a curative marketing approach should reflect factual truthfulness and honesty, simplicity, guided by transparency and system understanding. These are aspects important in the context of supply chains’ authenticity, consisting of expanded international expansion and inclusion, communication and empathy with critics, and the acceptance of personal responsibility. – requirements for exporting, protection of agricultural land (Dodds et al., 2013). This article is a part of a series. Read part 1 here.